We Were Woodwards: It's Alive! A blog about the life, times and family history of Gary Lee Woodward. Gary was born in 1939, married Helen Irene Pederson in 1960 and died in 1976 of a brain anerysm. Despite his short life - he remains forever alive the hearts of his four children and his loving sister (Vicki). Helen lived from 1940-2002, and she is very deeply missed too. It's my hope that by retelling the family stories (old and new), we keep their spirits alive today and for many subsequent generations. 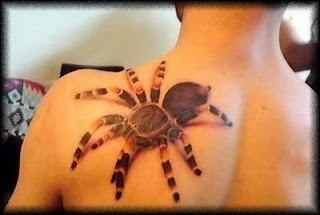 This is the coolest tattoo I have ever seen! I got this from Pollicino's website from Italy. .
we like your blogging style and we want to advertise your blog. 3. a detailed description of your site. we would be honored to advertise your blog on our blog! anyway my friend, keep on with your great work! I am the eldest Daughter of Gary Lee Woodward I know many stories about our family history. Like all stories, they are from my point of view and my siblings (Janis, David, Daniel) will likely disagree or have a different viewpoint to offer. I encourage all discussion and debates, after all history is highly subjective :-) My Mom's family are Norwegian Immigrants to Minnesota in the late 1930's and my Dad's family immigrated to Minnesota from Canada when there were only 1000 non-Indians in Minnesota in the 1820's. I was born in Duluth, Minnesota in 1973 and I married my husband, Guy, in 1995. Guy is an enrolled tribal member of the Santee Sioux, as well as, part German and Swedish.